In a nutshell, the Trace-Match methodology is the ability to generate a trace file both in the original VB6 code and in the migrated .NET code, and later compare the two results to verify that the original project and the migrated project behave in the same way when the same sequence of actions is performed on them. While the Trace-Match methodology alone can’t warrant full functional equivalence, for sure it is a powerful weapon in the hands of developers wishing to complete the migration process as quickly and correctly as possible. We at Code Architects have successfully used the Trace-Match methodology for our migration services and have refined it over time. Starting with VB Migration Partner 1.32, we are releasing this methodology to the public, so that all our customers can benefit from it. Adding trace statements to a VB6 project is quite easy: just load a VB6 project inside VB Migration Partner (version 1.32 or later) and invoke the Insert Trace statement command from the Tools menu. IT IS ESSENTIAL THAT YOU HAVE PREPARED A BACKUP COPY OF YOUR VB6 PROJECT, because even if the Tools menu contains the Remove Trace statements command, it isn’t guaranteed that it works well under all possible circumstances. Besides, this command doesn’t automatically undo all the manual refinements you have done (see next section). If you are sure that you have a backup copy of your project, click “Yes” and wait until the VB6 project is saved and reloaded. If the project doesn’t contain any BAS module, VB Migration Partner automatically adds a module named VBMigrationPartner_AppTrace.bas. It adds trace statements to all methods in the application. NOTE 1: Trace statements only include simple parameters (strings, numbers, dates, etc.) Object, array, and UDT parameters aren’t included in the list of traced values. NOTE 2: in rare circumstances, VB Migration Partner may incorrectly modify the VBP project file (see point A above) and the reference to the VB6TraceLib.dll isn’t valid. When this happens, you need to manually add a reference to the VB6TraceLib.dll file, which you can find in VB Migration Partner’s setup folder. 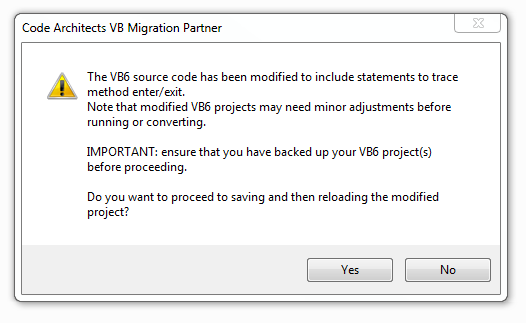 You can now exit VB Migration Partner and load the modified project inside the Visual Basic 6 IDE. The Insert Trace statements command saves you the drudgery of manually inserting trace commands in each and every method of your project, yet the code it produces uses the default trace settings. In many cases you might want to refine the generated code to precisely specify how the trace should look like. AppTrace.Init IndentTrace Or IncludeImplicit Or ShowTime, ""
The Init method accepts three arguments, all of which are optional. The IndentTrace option provides a better understanding of execution flow, but may cause several “false unmatches” when comparing files using a Diff tool. The ShowTime option provides a very basic profiling feature and is guaranteed to generate a different output under VB6 and .NET. As you may know, in the .NET Framework object destruction isn’t deterministic, and objects are finalized some time after they go out of scope or are explicitly set to Nothing. Because of this difference, the .NET version of the VB6AppTrace class can’t rely on deterministic finalization to detect when an object is destroyed or a method exits because of an error. For this reason, the IncludeTerminate or IncludeImplicit options often generate .NET trace files that somehow differ from the VB6 trace file. Finally, the OmitTrace flag omits writing to trace file. In this case, trace output from the VB6 or .NET application can be intercepted by means of DebugView or similar utilities. This feature can be very helpful for debug and test purposes, not just when implementing the Trace-Match methodology. The name of the method being traced is in the format “classname.methodname”, thus for example the MouseMove hander for the Text1 control on the Form1 form appears as "Form1.Text1_MouseMove" in the trace file. The above regular expression discards trace for any method whose name ends with “MouseDown”, “MouseMove”, or “MouseUp”. Notice that the exclude pattern only works at runtime. In other words, VB Migration Partner always adds trace statements to all the methods of all files in the current project or project group, but you can decide which methods should not emit trace output when you run the VB6 (or .NET) project. NOTE: the VB6TraceLib.dll component uses the Microsoft VBScript Regular Expression 5.5 type library to implement the exclude feature. If such a library isn’t installed on the current machine, specifying a nonempty string for the ExcludePattern argument causes a runtime error. When you later convert this code to .NET and run the migrated project, the corresponding VB6AppTrace.Init method in the VB Migration Partner’s support library automatically changes “VB6” (uppercase) into “NET”. This means that this code will create the test_VB6.txt file under VB6 and the test_NET.txt file in the migrated project. You never need to worry that the converted .NET project might accidentally overwrite the VB6 trace file. AppTrace.Trace "just before calling DoSomething"
trace_.Trace "just after calling DoSomething"
You can use either form of Trace method to trace the values of your variables, the state of the running program, details on the execution flow, and any other piece of information that is useful to understand what happens inside the application about to be migrated to .NET. 3. Run the original VB6 project and produce a set of trace files. Conceptually this step is very simple: you just run a well-defined set of actions on the original VB6 application and produce one or more trace files. We recommend that you prepare a script of these actions, with details such as: what menu commands you select; which push buttons you click (and whether you activate them using the mouse or the keyboard); which characters you enter in fields, and so forth. It is important that you precisely describe these actions, because you’re going to replicate them in the converted .NET application. We also recommend that you run the VB6 project as a compiled stand-alone file, because the behavior of interpreted and compiled VB6 projects can sometime differ. Here’s a very short example of trace file that might be produced by a simple VB6 application that has one form (Form1) and one class (Widget). The trace was obtained by loading Form1 and then clicking on its two button (Command1 and Command2), where the Command2_Click event handler creates an instance of the Widget class and invokes its One method, which in turn invokes its Two method. Notice that the IndentLevel, ShowTime, and IncludeTerminate options are all enabled. The lines that contain two asterisks are produced by calls that originate from inside a Terminate event (in this case the Class_Terminate event of the Widget class). As you see, calls that originate from the Class_Terminate event of the Widget class aren’t displayed any longer and that the lack of indentation makes it more difficult to follow the execution path. Nothing special here: this is standard stuff for all VB Migration Partner users. It is essential, however that you strictly adhere to the convert-test-fix methodology we recommend in our documentation. This methodology dictates that you never modify the converted .NET code to solve compilation and runtime errors; instead, you add one or more pragmas to the original VB6 source code and then re-convert the project to .NET. NOTE: Because pragmas are just special VB6 comments, the convert-test-fix approach ensures that the trace files you have created at previous steps continue to be valid and correctly describe how the VB6 code behaves. This step completes when you have a .NET project that compiles correctly and run without any runtime exception. Unfortunately, running without errors doesn’t necessarily mean that the .NET code is functionally equivalent to the original VB6 project. Ensuring functional equivalence is the purpose of the Trace-Match methodology. Now that the .NET code runs with no visible exceptions, you can perform the same set of scripts and test cases seen in step 3, and produce a similar set of trace files. You now have all the trace information you need, both from the original VB6 project and the converted .NET project. Using a Diff tool like WinMerge it’s easy to spot any major and minor difference between the VB6 and .NET trace files. Even not considering the difference in timing, the most obvious difference with the original VB6 trace file (see step 3 above) is that calls originated from the Class_Terminate event in the Widget class come after the Form_Unload method in the .NET code, whereas they followed the exit from Command1_Click method in the VB6 project. The reason for this difference is that .NET objects are usually destroyed later than the corresponding VB6 object. Worse, if the object is being destroyed when the entire application is shutting down you might not see any trace from their Class_Terminate event handler. NOTE: For the same reason, you might not see the “---- END --- “ line in trace files produced under .NET. In fact, the VB6AppTrace object might be destroyed before the last operation. To avoid false mismatches caused by undeterministic finalization, by default VB Migration Partner’s trace mechanism omits trace output originated from inside the Terminate event handler of forms, classes, and user controls. However, if you specified the IncludeTerminate option (see step 2 above), this output is included in the trace file but is marked with a double asterisks. As its name suggests, the AutoGC option forces a full garbage collection each time a method is exited (that is, when the VB6AppTrace.ExitMethod is called). Such forced garbage collections reduces the gap between deterministic (VB6) and undeterministic (.NET) finalization, which in turn reduces the differences between VB6 and .NET trace files. Keep in mind, however, that even when you enable this option, the deep differences between the two finalization mechanisms aren’t solved completely. Also, each garbage collection adds overhead to your code, so be prepared for higher execution timings when this option is enabled. Once you are 100% sure that the converted code behaves exactly like the original VB6 project and that functional equivalence has been reached, you can remove all trace statements from the VB6 project and perform the final conversion, to produce a fully working .NET project that contains no trace statements. 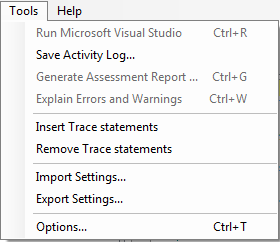 This step is fully automatic, thanks to the Remove Trace statements command from VB Migration Partner’s Tools menu. If you have decided not to stick to the convert-test-fix methodology, however, you will have to manually remove all trace statements from the .NET project. You can easily do it with a global Find and Replace command, or you can define a Visual Studio macro that does the job for you. The following text describes how to create such a macro. 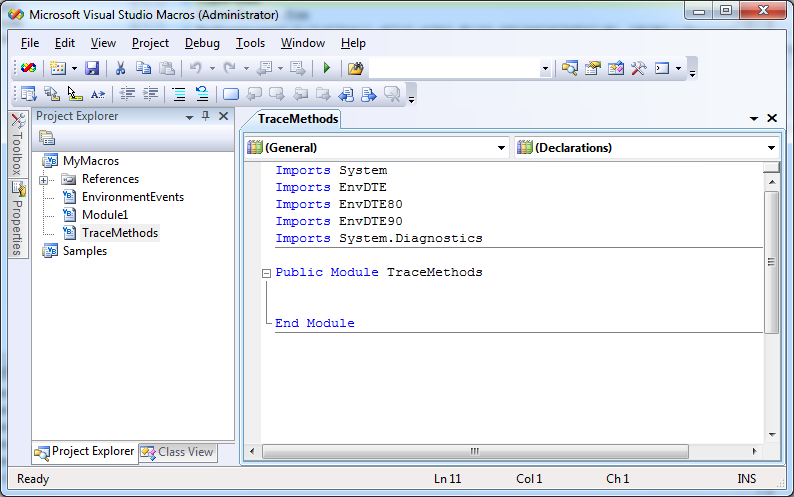 Launch Visual Studio and select the Macro IDE command from the Macros submenu of the Tools menu. This action brings you to the Microsoft Visual Studio Macros environment. Select the MyMacros node in the Project Explorer window, then select the Add Module command from the Project menu. & "|(Public AppTrace As New VB6AppTrace\r\n(\r\n)?)" You can now save the macro you’ve just created and return the Visual Studio (use the Close and Return command from the File menu). 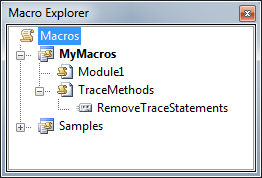 From inside Visual Studio, select the Macro Explorer command from the Macros submenu of the Tools menu, which brings up the Macro explorer window. You can finally right-click on the RemoveTraceStatements element and select the “Run” command to remove all trace statements. The following dialog might appear: if so, just click “Yes” to reload all modified files. IMPORTANT: this action is destructive and overwrites all the files in the current VB.NET solution. It is therefore essential that you run the macro only after creating a backup of the solution, in case the remove operation mistakenly deletes vital portions of your code. The Trace-Match methodology is a powerful tool that allows VB Migration Partner users to quickly reach functional equivalence and to obtain “objective” evidence that such equivalence has been reached. By adding additional trace statements, developers can easily create a set of test cases that can run unattended. For example, such additional statements can trace the contents of user interface elements – e.g. the text inside a TextBox, or the selected item in a ListBox control – so that no human intervention is necessary to confirm that the converted project delivers correct results. Code Architects is the only vendor that offers Trace-Match or a comparable tracing methodology. Not only do we allow you to prove that your code works and behaves like the original VB6 code, we even provide you with the tools that quickly insert and remove all the trace statements on your behalf.